All photography above, Eric Morin for the December 2006 World of Interiors. 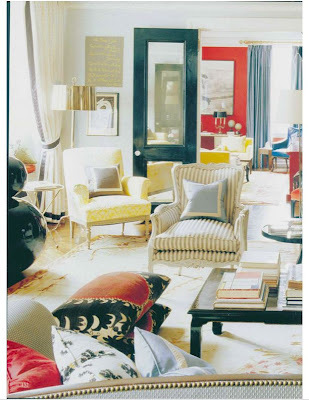 I've mentioned Kate and Andy Spade's New York apartment several times since it appeared in World of Interiors. But this week I have clearer images to share. At first glance the apartment looks like happy chaos -- pattern-on-pattern, bold color, and loads of even bolder art. Yet, the symmetry gives it harmony and order. 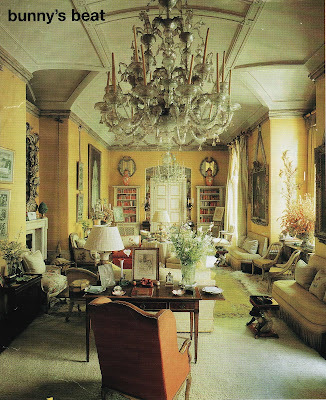 To me, it feels fresh and a tad stately -- like Ingrid Bergman's London apartment in Indiscreet. Steven Sclaroff helped orchestrate the Spade's mix. 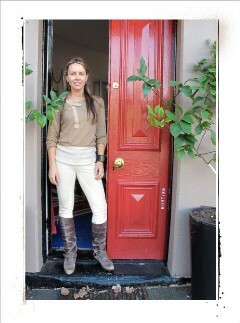 Click images above for details such as red trim on the entry bench. Photography above, Oberto Gili for House Beautiful, March 2001. Here we have early Miles Redd, circa 2001. His signature "trad - mod - glam" mix is already evident. 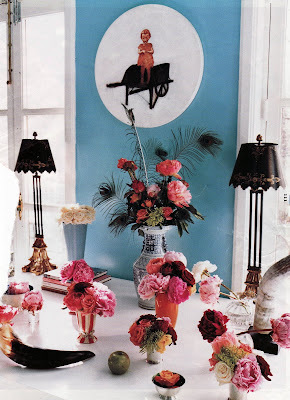 A while back I posted the top image, for flower arranging inspiration, and I was asked to share other images of the home. So, complete with frayed edges, I offer a few more tear sheets from my archives. Perfect pics to celebrate peony season. 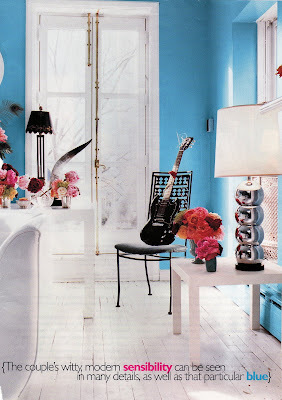 Photography above, Derry Moore as seen in Elle Decor. Yellow is so chic at the moment. 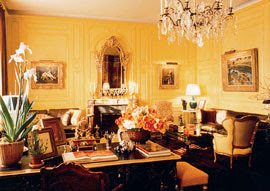 It's interesting that two of the most celebrated rooms in 20th century interior design had bold lacquered yellow walls: Nancy Lancaster's legendary London sitting room/office, shown top, and Babe and Bill Paley's Fifth Avenue drawing room, decorated by Albert Hadley and Sister Parish, shown second. In both cases the yellow walls apparently brought an inviting sense of warmth to grand spaces. Sister was the one who thought the Paley's room should be taxicab yellow. Five subtly different shades of yellow high-gloss paint were applied to set-off the Paley's master paintings by Gauguin and Van Gogh, as well as their French antiques. In Lancaster's vaulted room, her associate John Fowler applied numerous layers of glaze over stippled-on Peking yellow (or butter yellow) paint. For more on the Paley room, see Albert Hadley: The Story of America's Preeminent Interior Designer. 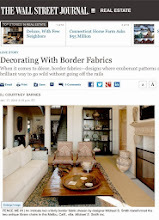 For more on Lancaster's room, see Nancy Lancaster: English Country House Style, or Rooms. 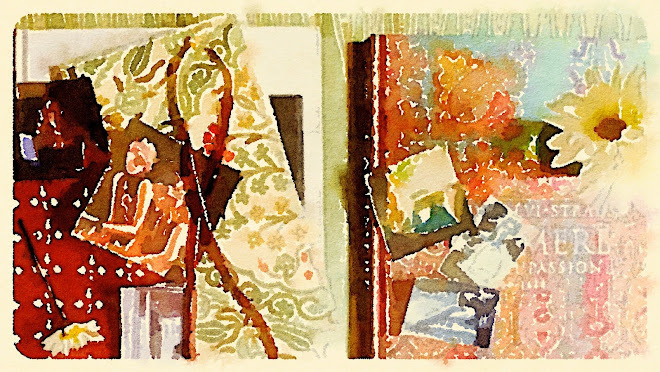 BTW: Colefax and Fowler keeps Lancaster's yellow room open to the public. 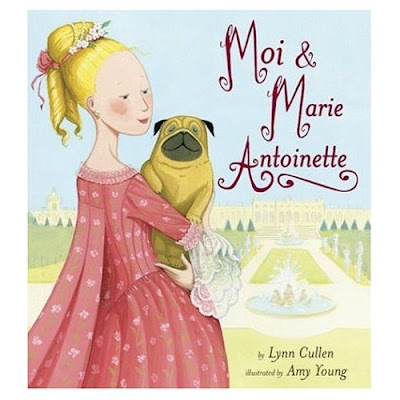 Big Hair and Little Dogs: The World of the Young Marie Antoinette -- a special afternoon event to be hosted by the High Museum of Art on Sunday, May 13 at 2:15 p.m. Lynn Cullen, author of Moi and Marie Antoinette, will give a kid-oriented presentation on court fashion and etiquette. Her book is a whimsically illustrated account of Marie Antoinette, told from the perspective of her pug dog, Sebastien, beginning with Antoinette's life at age 13. The author will also sign books from 1 to 2 p.m. and 3 to 4 p.m. Event is free with Museum admission. 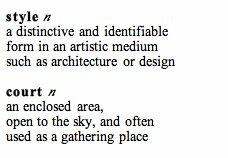 BTW: While at the High, don't forget to see the amazing collection of furniture and decorative accessories that once belonged to the French kings and queens. These pieces will be on view through September 2. Style-obsessed readers in Savannah and Atlanta, open your date books: the Savannah College of Art and Design, known to locals as SCAD, will host its second annual design week, SCAD Style, May 10–19, with events in both cities. 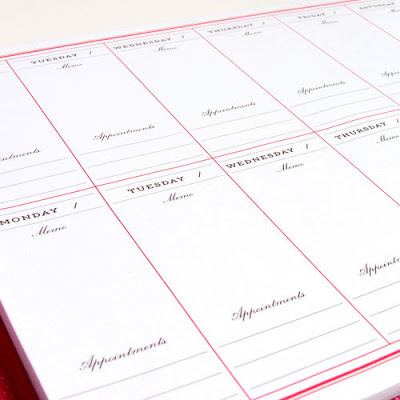 Most of the week's happenings are free and open to the public. Brooklyn-based trendspotter Grace Bonney, a.k.a. design sponge, speaks Tuesday, May 15 at 3 p.m.
Caroline Weber, dynamic young historian and author of Queen of Fashion: What Marie Antoinette Wore to the Revolution, speaks Tuesday, May 15 at 6 p.m. A book signing and reception follow at 7 p.m. Ending the night: an 8:30 p.m. film screening of Sofia Coppola's Marie Antoinette. Weber teaches at Barnard and, in addition to her scholarly work, she has written for Vogue. Her recent slide presentation at the High Museum of Art was excellent, so I definitely recommend this event. 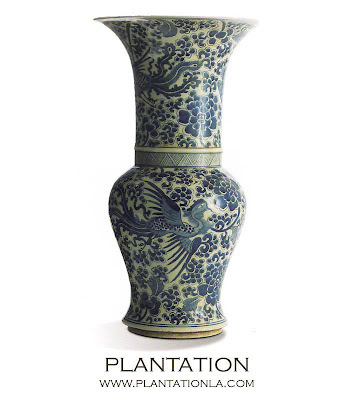 Acclaimed interior designer and author Vicente Wolf speaks Wednesday, May 16 at 5 p.m. Throughout his presentation Wolf will use his own photographs, taken around the world in countries including Ethiopia, Madagascar, Myanmar, Syria and Borneo, to share his unique global design perspective. Marketing master Andy Spade, CEO and co-founder of Kate Spade, participates in a question-and-answer session, Thursday, May 17 at 7 p.m.
On Saturday, May 12 from 2-4 p.m., at Savannah's Paris Market & Brocante, 36 W. Broughton St., SCAD President Paula S. Wallace signs a book she co-authored, A House in the South: Old-Fashioned Graciousness for New-Fashioned Times. Sofia Coppola's Marie Antoinette screening in the SCAD-Atlanta Hub, Saturday, May 12 at 8 p.m. It would be fun to see this again on the big-screen, with an audience of stylophiles. Veranda senior editor Tom Woodham moderates a panel discussion, "Interior Design: Atlanta and Beyond," with designers Dan Carithers, Suzanne Kasler and John Oetgen on Monday, May 14 at 7 p.m. 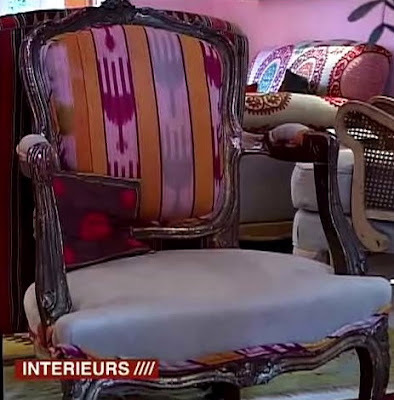 Topics include the interior designers' work, their struggles, and their successes. Above, Vanessa De Vargas photographed by J. Emilio Flores for The New York Times. Interior designer Vanessa De Vargas, owner of the chic Venice, California showroom, Turquoise, is known for giving vintage furniture a glamorous new life. Now, if you have a needy piece that could benefit from a makeover, Vanessa will come to your rescue. Send her two photos -- one image of the item in need and another image of the room where the piece will be placed -- and tell her what colors and design styles you prefer. 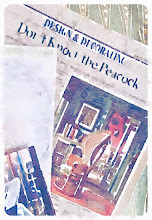 After evaluating your piece, she will post on her blog a mini inspiration board complete with fabric samples, lacquering options, and tear sheets from magazines. For details visit the Turquoise LA blog. 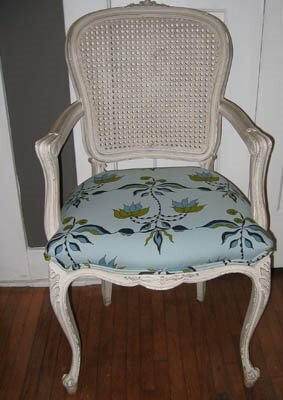 Lulu de Kwiatkowski's hand-printed cotton Moondance in light blue has long been a favorite of mine, and I love how Vanessa used it, above, to reinvent this vintage Louis XV-style armchair. So fresh! 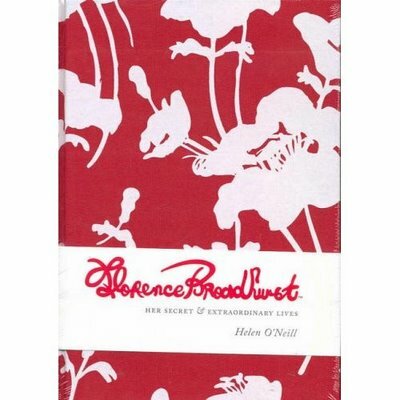 To celebrate the release of Florence Broadhurst: Her Secret & Extraordinary Lives, Petite Tresor and Chronicle Books just announced an exciting Florence Broadhurst giveaway. Prizes include a limited-edition Broadhurst fine art print valued at $2,100, a Broadhurst fabric saddle bag, and signed copies of the book. According to Chronicle, this book combines lush images of Broadhurst's innovative, Asian-inspired fabric and wallpaper along with narrative about the designer's complicated life story. I've been enticed by that crisp red-and-white cover for months now, so I'm glad it's finally hitting U.S. shelves. Posted with permission from Petite Tresor. 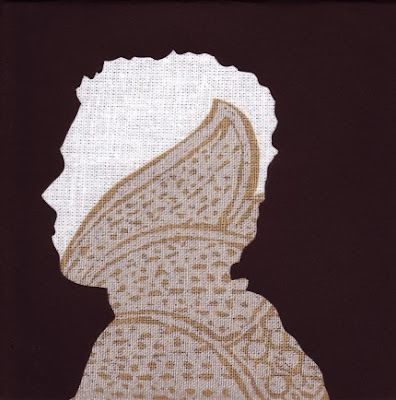 Above, "Chris 2," silhouette, mounted on canvas panel with high gloss finish, 5" x 5" $25. Above, "Fry 2," silhouette, black paper on Sea Anemone pattern mounted on canvas board with high gloss finish, 8" x 10" $50. 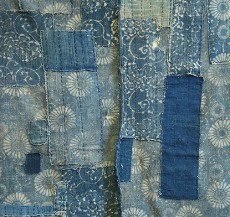 Artist and designer Frances Merrill seems to have inherited the textile gene. 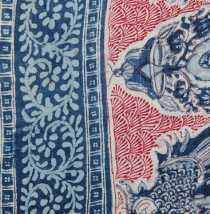 She is the great-great niece of legendary Thai-silk purveyor Jim Thompson, and after college she decided to formally study textile design. These days, Frances incorporates her passion for fabric into bold works that shake-up classic silhouette-style portraits. 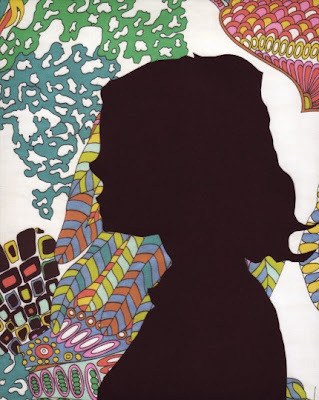 She pairs a traditional hand-cut silhouette -- sometimes of a person or animal, other times of an Eames chair or Tizio desk lamp -- with a complimentary swirling paisley, African print, or graphic ikat pattern. The results are lively and intriguing. 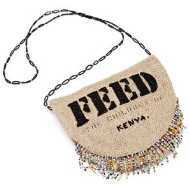 Visit her online shop, Reath, to see her collection and learn more about her custom pieces. 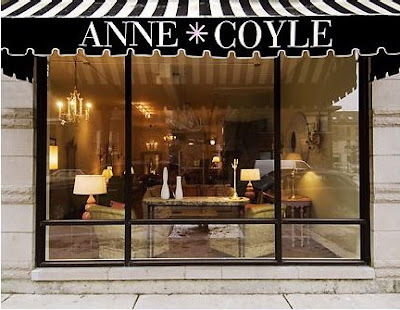 If, like me, you can't stop by decorator Anne Coyle's stylish shop in Chicago anytime soon, visit her site to see the luscious new rooms in her portfolio. The woman can really rock pastels and black lacquer. 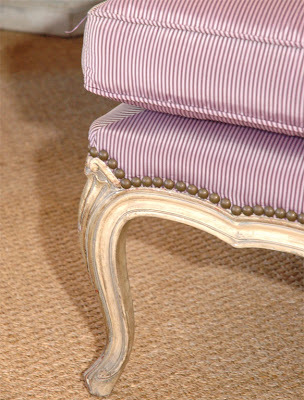 Above, a petite vintage French settee available through Chapman Radcliff. 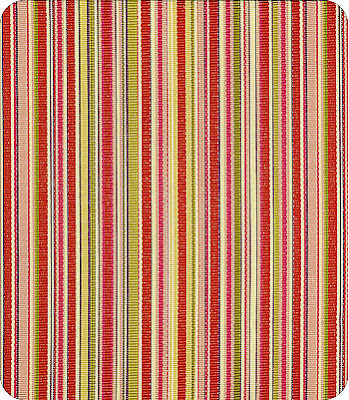 Above, Lewis Sheron's budget-friendly "Anastasia" stripe is $14.98 per yard. 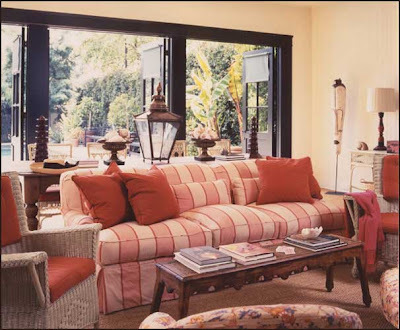 Above, a pink-striped sofa in the California cottage of Ruthie Sommers, photographed by Grey Crawford for Cottage Living, December 2006. 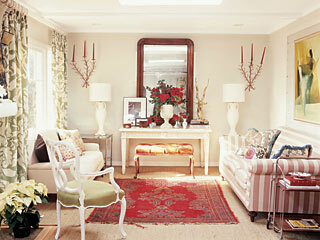 Visit Orange Beautiful to see the latest incarnation of Ruthie's living room. Above, Suzanne Rheinstein used wide pink stripes in her garden room. 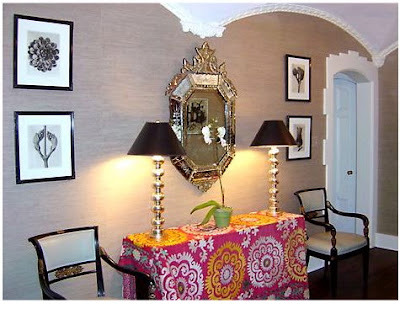 Another view of this room can be seen in Designing Women: Interiors By Leading Style-Makers. Like the Herrera Women, I'm very drawn to stripes. And I'm especially impressed by decorators like Suzanne Rheinstein and Ruthie Sommers who deftly use pink candy stripes in a non-saccharine way. 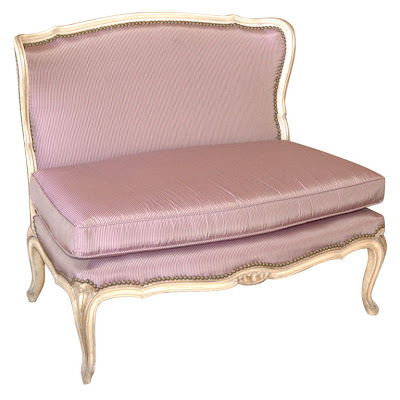 Lewis Sheron's "Anastasia" stripe in "shell pink" has a great ribbon-candy feel, and seems to be begging to cover a bench or small French piece like the settee shown top. The touch of red and green keep this stripe from being ultra-feminine. 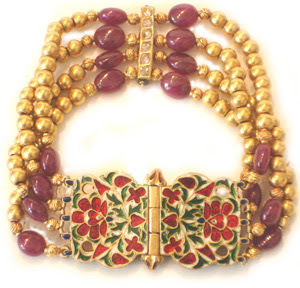 Wall Street Bead has a lovely selection of vintage Indian jewelry, including the bracelet above. 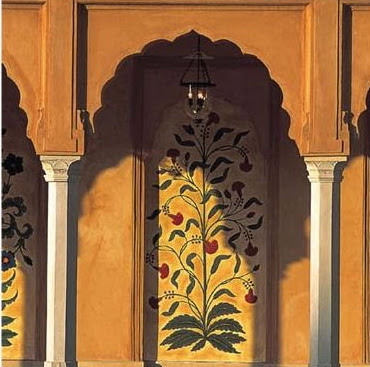 Above, Mughal inspired design as seen at The Oberoi Amarvillas, Agra, India. India's colorful intricate jewelry, lush interiors, grand architecture -- acclaimed interior designer Sunita Kohli is passionate about all of it. She is best known for designing hotels and for her restoration work on Rashtrapati Bhawan-- once the Viceroy’s House designed by Sir Edwin Lutyens and Sir Herbert Baker -- but antique Indian jewelry is a special interest of Kohli's. She will share her knowledge at Emory University's Carlos Museum during a free talk, "Tales of Mughal Jewelry and Great Indian Diamonds," on Monday, April 23 at 7 p.m. 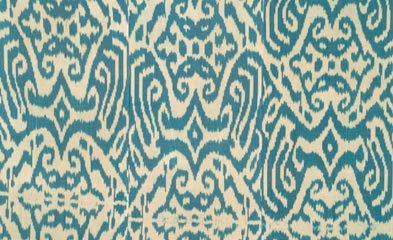 It would be fun to reinvent a vintage chair using a remnant of ikat -- ideally a pattern from Robert Kime or Madeline Weinrib's "Turquoise Luce," shown below. But economically priced silk-cotton ikats in luscious colors can be found on eBay and at Uzbek Craft. Although Uzbek Craft offers wholesale prices, all items ship from the Republic of Uzbekistan, so double-check shipping costs to the U.S. and inquire about the exact dimensions of available ikats. 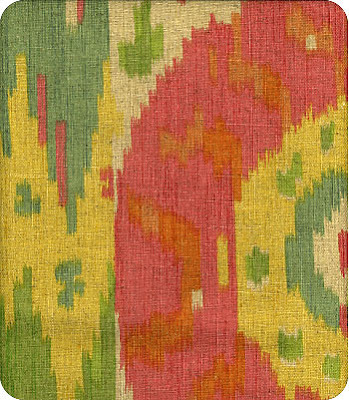 Lewis Sheron, based in Atlanta, has an ikat-like pattern, "Santana," below. 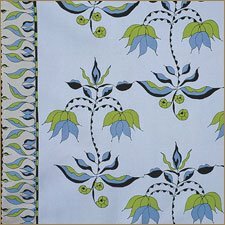 It costs $13.98 per yard and can be found online under Fabric, Contemporary. Swatches cost about $2.50. 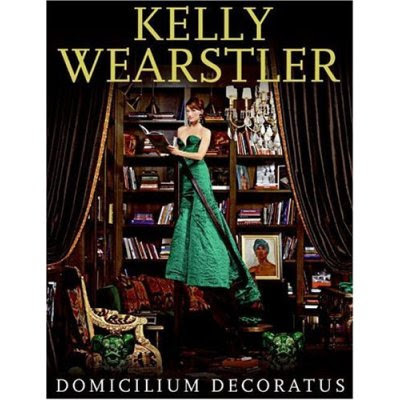 Above, Kelly Wearstler upholstered a chair with ikat in her Hillcrest library, as seen in Domicilium Decoratus. 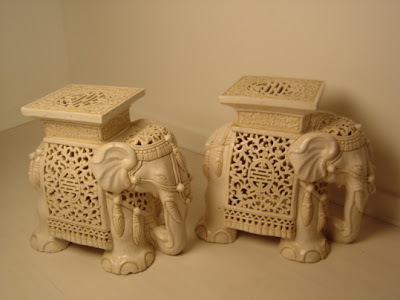 All-ivory coloring and intricate pierced patterns give these vintage ceramic elephants special flair. 16.5" high x 18" wide x 10" deep. Available through Pieces. 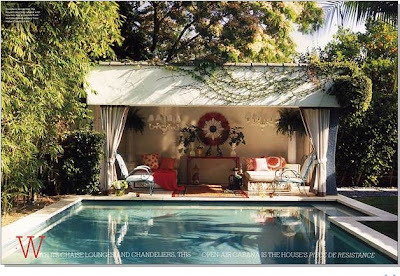 If you look very closely, above, you can spot a similar elephant apparently used as a low drinks table in a cabana designed by Ruthie Sommers, as seen in the October 2006 issue of California Style Magazine. Click image to enlarge. For more exquisite little elephants, see Small Wonders. By popular demand, above are more images of Carolina Herrera, Jr.'s Madrid home photographed by Eric Cahan for Domino, spring/summer 2005. 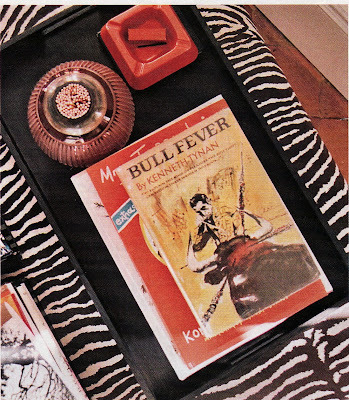 I just love that ottoman covered in Brunschwig & Fils "Le Zebre," top. Below is evidence that Carolina and her terribly chic mom share not only the same name, but also a passion for lovely fabric, upholstered walls and stripes. 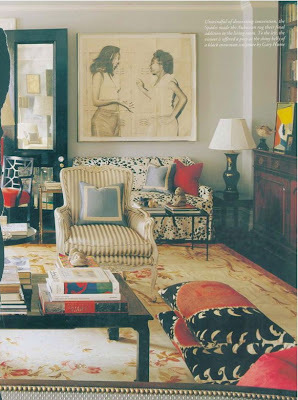 Above, Carolina Herrera photographed by Jonathan Becker in her New York sitting room, as seen in Domino, September 2006. Click on images to enlarge. 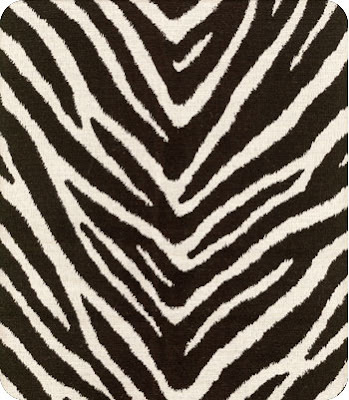 BTW: Lewis Sheron offers a very budget-friendly animal stripe, "Bengal," similar to the pattern on Herrera's ottoman. The price is about $12 per yard and the colors available are "sand" and "jet," as shown below. Preview swatches can be ordered online for $2.50, or you can visit the mammoth Atlanta fabric store located at 912 Huff Road.